The harmony of the historical and the contemporary in a refuge on the Douro. Nestled into a green cliff overlooking the Douro River in Baião province, the small palace covered in blue tiles and the contrasting white minimalist building that make up the Douro Palace Hotel Resort & SPA stand out. This combination of the historical with the contemporary has brought to life a hotel with elegant spaces, boasting modern design and refined details, and also benefiting from the superb location and the refreshing natural surroundings. The highlight is the panoramic view over the valley and the river that can be appreciated from the swimming pool, the terrace and the interiors, especially the rooms, all of which have large windows and balconies. The SPA is also worthy of special mention. Taking its inspiration from the landscape, its philosophy is centered on introducing the produce of the Douro region through genuine sensorial experiences like the aromatic bath of either citrus fruits or wines, the Port wine wrap or the exfoliation with flowers and wild berries. Also available at the hotel are a restaurant and several bars, as well as multi-purpose spaces for corporate or private events such as meetings, conferences or weddings. 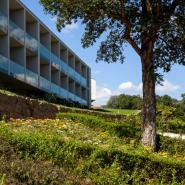 The hotel offers all the conditions for an unforgettable break or a successful business trip. When leaving Oporto, follow the directions to highway A4 - Vila Real. While driving in A4, take the exit to Marco de Canaveses. Forthwith take the intersection that goes through Marco de Canaveses, in direction to Baião. Arriving in Baião you'll find a roundabout. Take the first exit and on the following roundabout take once again the first exit. Go straight ahead for about six kilometres, until arriving to an intersection. Take a left to Régua and after driving two kilometres you'll find directions to the hotel. When arriving to Santa Cruz do Douro, follow the blue signs to the hotel.